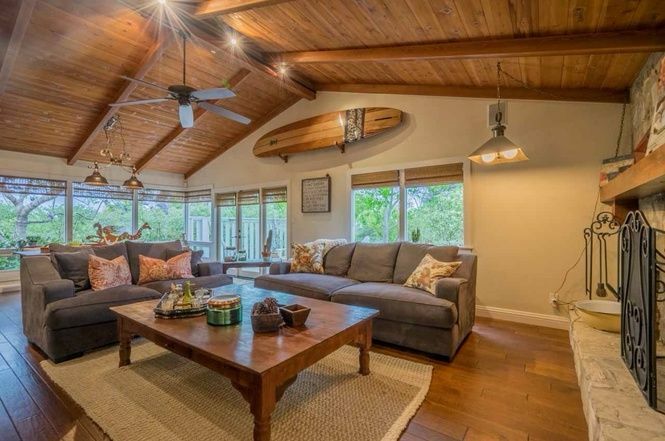 Built in 1981, this beautiful California Craftsman home, listed on Redfin, sits on a 1.08-acre lot only several minutes away from the beach. With lofty high beam ceilings and a luxurious pool in the backyard, it was designed for someone who loves to entertain! A charming pathway winds through the front yard, passing by a beautiful fountain and ending up at the front entrance. 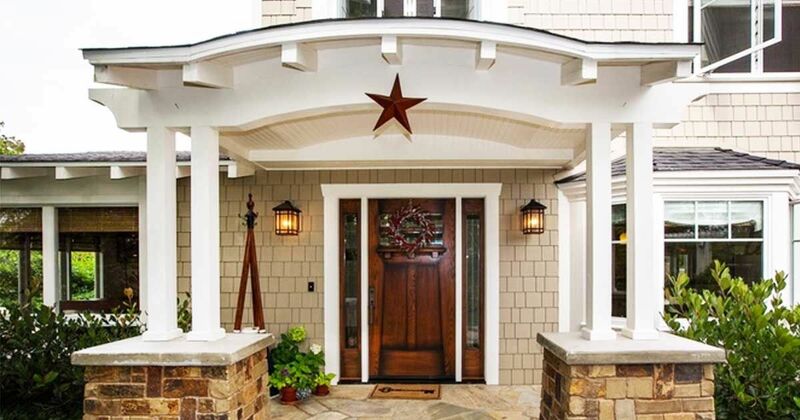 The exterior of the home has plenty of Craftsman appeal thanks to exposed rafters, paned windows, and stonework at the base of the columns on either side of the front door. The spacious living room features soaring beamed ceilings and beautiful hardwood floors. A large stone fireplace off to the right keeps the room nice and warm, while plenty of large windows flood the space with natural light. 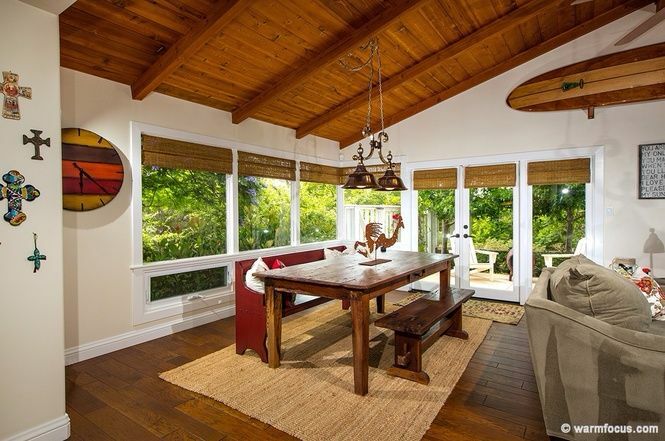 The dining area is located directly behind the living room, and it takes full advantage of the many windows. A farmhouse-style table with benches lends a rustic touch to the room, and double doors at the back lead out to the patio. 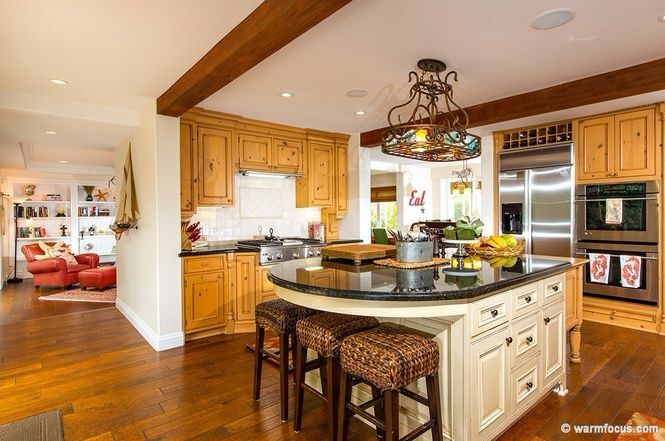 The same rustic feel can be found in the large country-style kitchen. Plenty of storage space is provided by the custom-made pinewood cabinets, and the large central island includes even more storage space as well as a breakfast bar. 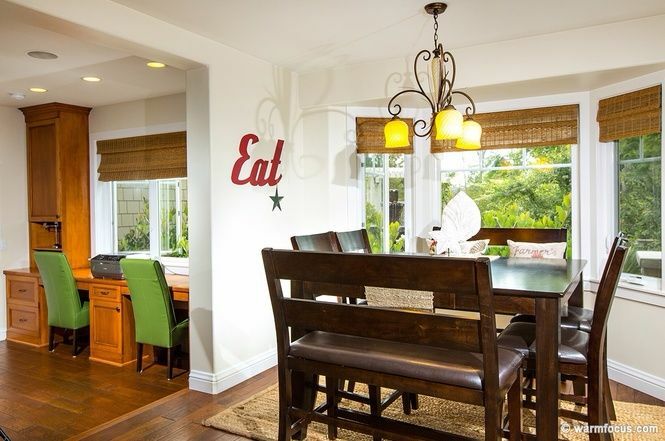 A small dining nook is located behind the kitchen for more casual meals, and large picture windows overlook the lush front yard. Off to the left is a handy built-in desk with two seats and ample storage space. 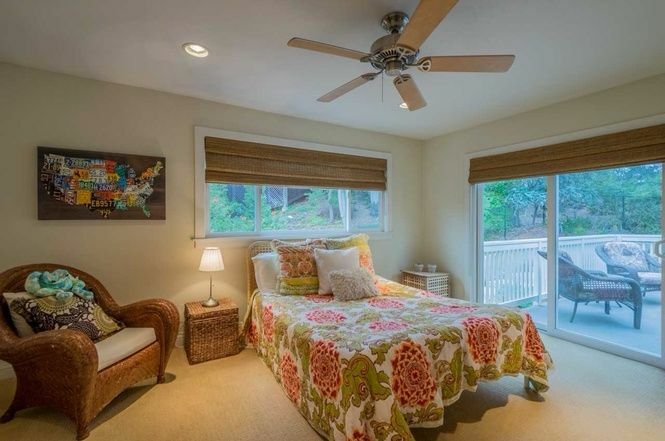 The spacious master bedroom has a vaulted ceiling and plenty of space for a king-sized bed. A small sitting nook is tucked away next to the window on the far back wall. This well-lit bedroom is quite different from the master bedroom, but it's also quite roomy. It has the added advantage of sliding glass doors that lead out to the patio. 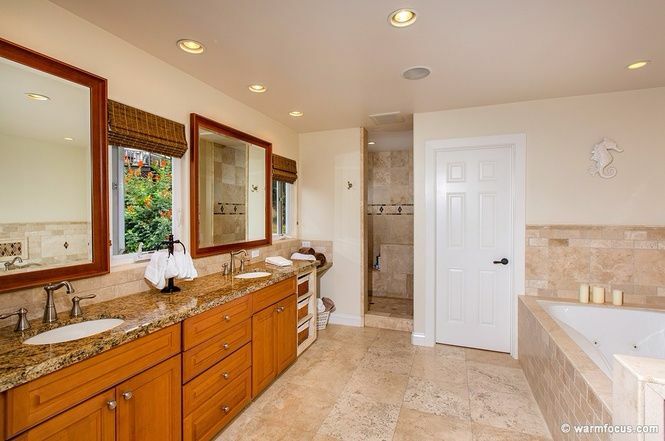 Here we have the master bathroom, which boasts a luxurious jetted tub, a shower with dual shower heads, his and hers vanities, and gorgeous limestone tiling. Of course, the vanities offer plenty of storage space. 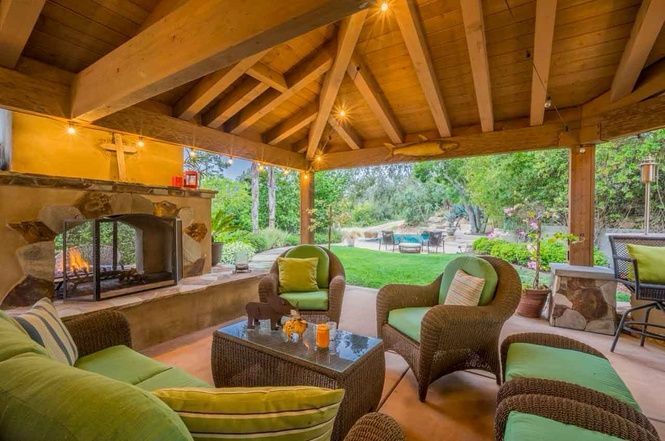 Behind the home, you'll find a gorgeous patio with plenty of seating. The beautiful vaulted ceilings are a reflection of those found in the living room, and the large built-in fireplace ensures that the space always feels cozy and welcoming. 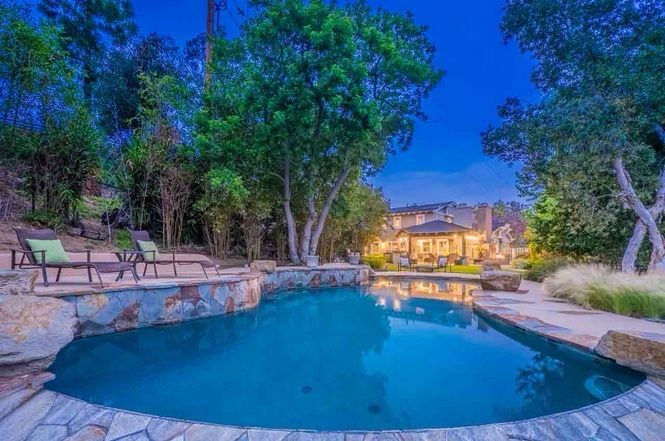 In true California style, the home also has a luxurious vanishing edge pool out back. Just in case the patio doesn't provide enough seats for guests, several more seating areas can be found scattered around the pool. 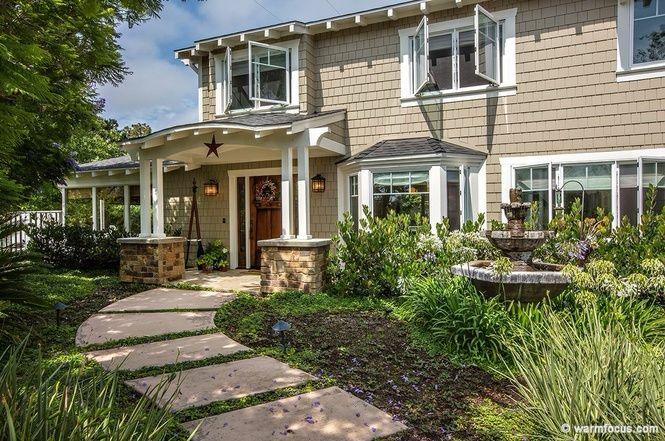 Do you love this gorgeous home as much as we do? Let us know in the comments on Facebook, and be sure to share this article with your friends if you loved it!